So if you loved the Quinoa Peanut Butter Dark Cho Cup idea but aren't really a peanut butter person, then this is perfect for you! Well, if you like coconut... I really like the PB cups but these coconut butter cups are actually unreal. These are truly a great treat that you will love, your family will love and your kids will love - but you will avoid added sugars and additives. We don't want any of that now do we... nope. Truly these aren't that different from the Quinoa Peanut Butter Cups, you just replace the peanut butter with coconut butter and use coconut flakes instead of quinoa. On the other hand though, you can totally top it with quinoa as well or instead of the coconut if you would like. That's why I made two of these recipes because you really can play around with them and just mix and match. Fill them with whatever your heart desires! 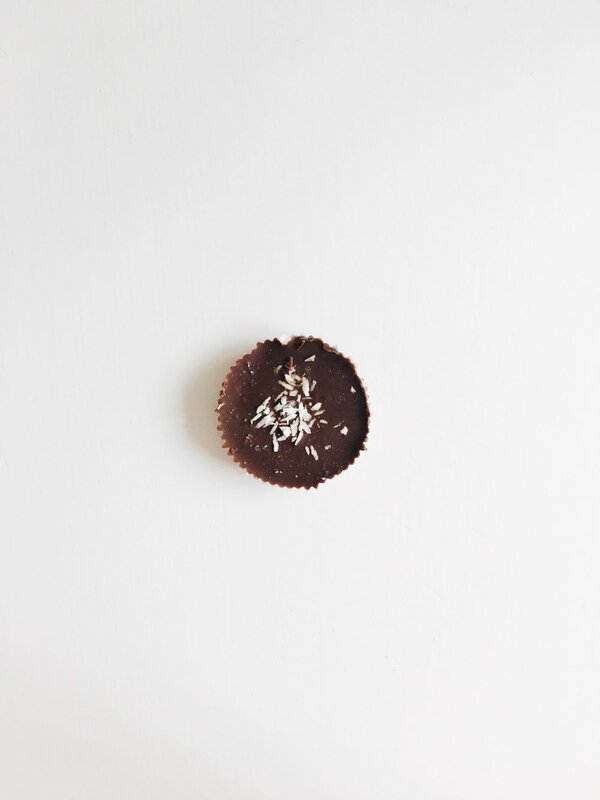 Like I mentioned in the PB cups post, these are inspired by Eating Evolved Coconut Cups. I really liked the idea and loved the healthy fat treat - but I wanted them to be added sugar free. Now, Eating Evolved uses coconut sugar, which is way better than refined sugar but I just wanted to make one that was clean from any added sugars. And, as I mentioned, we don't have anything like it here in Denmark - so I'm, in a wonderful way, forced to make my own. So give both the PB and the Coconut Cups a try and let me know which one you love best or let me know if you simply love them both equally! 9. After the 15 minutes, pour the melted chocolate evenly into the muffin pan.